Lisa began on her healing path in 1995 while caring for her dying mother. Her mother was dying from metastatic breast cancer and while she handled her illness with dignity and grace, Lisa felt helpless. It was during a search for a means to deal with that difficult situation, Lisa discovered Reiki. After taking Reiki I and Reiki II, she began to expand her horizons and discovered the wonderful healing properties of crystals. Evidently all those years of rock collecting was establishing a foundation for my later work! While working through difficult times at her day job as a network engineering manager and dealing with various personal issues, Lisa entrusted her fate to Jesus and was led to several life-changing teachers that opened the doors of her spiritual path that led to the creation of Amethyst Rose Healing Arts. Like so many people with heightened spiritual awareness, these gifts run in the family. Since embarking on her spiritual path, Lisa has become more aware of the gifts within her own family. Her maternal great-grandmother was a noted psychic and used to travel from her small city home in Massachusetts to New York City to do readings! The gift of working with Jesus to bring healing to others came from her father's side of the family. One of her cousins, a Catholic priest, was a Charismatic Healer. In addition, there are numerous anecdotes and stories about various members of the family, most of them on the other side of the veil now, who had amazing abilities communicating with animals, psychic knowing, and healing others. Now, Lisa is a Reiki Master Teacher and shares her knowledge of Reiki with others both during her classes as a teacher and during client healing sessions as a practitioner. In both teaching and practicing Reiki, Lisa utilizes all aspects of her acquired spiritual knowledge, intuitively manipulating energy and clearing energetic blockages to enable the love and healing to flow. She received her Reiki Master attunement in the Sekhem-Seichim Reiki tradition (facets I through VII) from David L. Gleekel at the Reiki Center of Greater Washington and her Usui-Tibetan Reiki Master attunement from William Lee Rand from the International Center for Reiki Training. Her Usui-Tibetan attunement was received in the middle of Stonehenge in England, and was a very life-changing event. 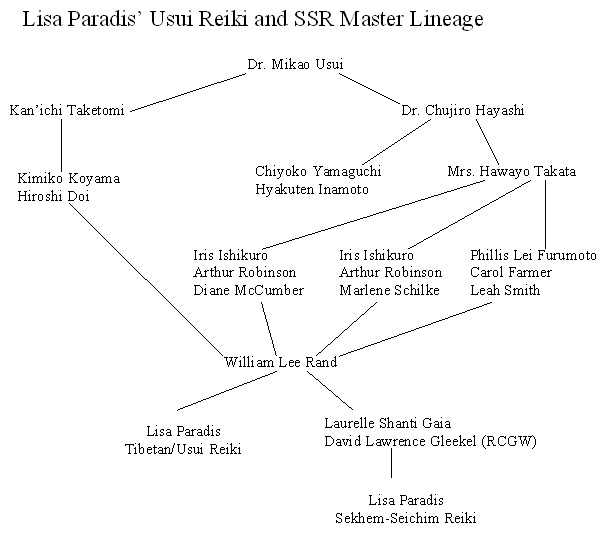 Lisa's Reiki lineage can be viewed here. Lisa has a life long love of crystals and has now amassed a (still growing!) collection of many differing varieties, shapes, sizes and crystal forms. Lisa uses her crystals extensively during her healing and channelling sessions to complement Reiki. This has given Lisa a vast amount of experience relating to crystal uses and added to her already in-depth knowledge of crystals and their properties. As well as putting all this knowledge and experience to good use in her healing sessions, Lisa also shares it during her hugely popular Crystal Discovery & Healing classes. Read more about these lovely classes here. Lisa is a skilled empath, trained in spiritual healing, and cutting cords of attachment as a student of Rose Rosetree. She also runs the SkilledEmpaths forum on MSN. Lisa is actively studying additional energy healing modalities to complement her skills. Simon Davies is a professional working spirit medium & psychic intuitive at Amethyst Rose Healing Arts. He is an evidential medium & is clairvoyant, clairaudient and clairsentient (he sees, hears and feels those in Spirit). His mediumship and readings are part of his vocation and desire to serve others by revealing to them love, healing, messages and guidance. He offers his readings both by telephone and face to face. Simon's clients are based worldwide and he is rapidly developing the reputation as one of the most remarkably accurate, insightful and ethical mediums of the current day. He has received many acknowledgements for his astonishing ability and accuracy, some of which can be read in our Testimonials section. Simon's vocation is such that he has developed our Fair Fee policy. This means people are not priced out of having the readings that they need. We try to ensure this by setting reasonable suggested reading fees. Our policy is that it is more important for you to receive the love, healing, messages and guidance from Simon than it is for us to receive our fee. We are not promoting free readings but we are trying to take into account peoples' ability to meet our fee. There are no other charges to you & prepayment for your reading is not needed. All readings with Simon must be booked in advance please, although no prepayment is required. You only pay for your reading if you are happy with it. You can read more about Simon and his reading philosophy here. Simon also teaches, and co-hosts many of our Reiki and Crystal classes with Lisa.